Okay this is fun. I returned from vacation last week and found two bubble mailers waiting for me. Yes, one was in New Jersey while the other was in California, but it’s still an exciting thing to find waiting—especially when one of the mailers was unexpected. Before I left for vacation I sent CommishBob a couple cards to help him with his 1970 set build. My current collection focus* has been pretty efficient so far. What duplicates I do have are typically junk wax from my childhood collection. But for whatever reason I’d accumulated a bunch of Giants dupes from 1970—including two that Bob needed. So I sent them out and, once I learned that they arrived okay, kind of forgot about the whole thing figuring that some day an envelope would arrive with a couple early-70s Giants cards that I needed. *San Francisco Giants team sets as I suggested would happen a few months ago. I’ll have to write a proper post about this in the future. I couldn’t have been more wrong about what would arrive and I’m kind of bummed that my wife* got to open the package instead of me. Thankfully she sent me photos. 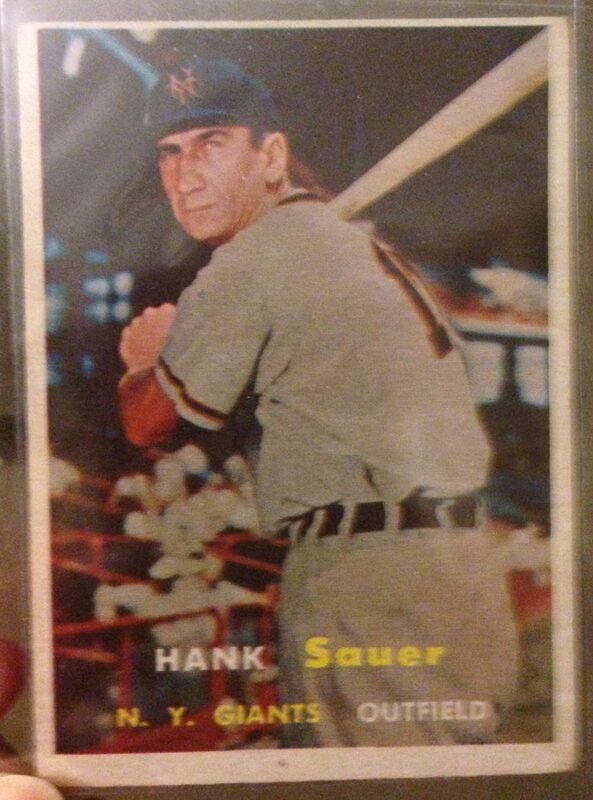 I’d’ve been happy with just the 1957 Sauer card let alone a 1957 and a 1958 card. As a kid, my oldest cards—aside from the 1917 Zeenuts which I discovered late and belong in their own category—were from 1960. Anything from the 1950s was unfathomable for me. 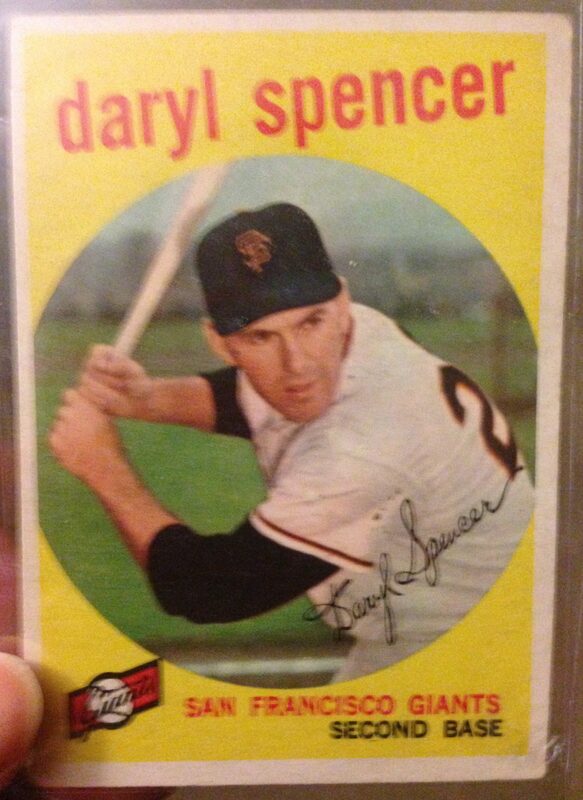 And getting a card from before the Giants moved to San Francisco? Amazing. *Stuck in New Jersey for work reasons. But Bob didn’t stop there. 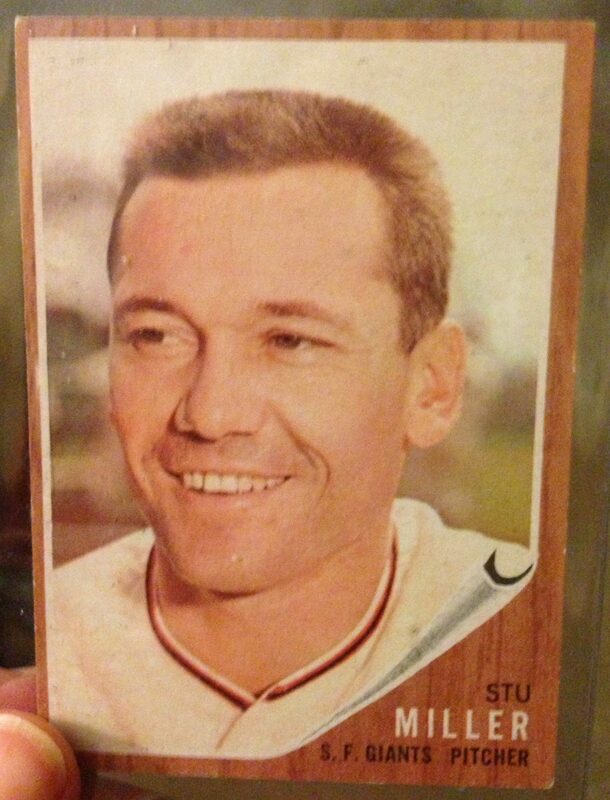 There were also three 1959 cards. Aside from the age factor, there’s something about the 1950s designs which are especially evocative for me. 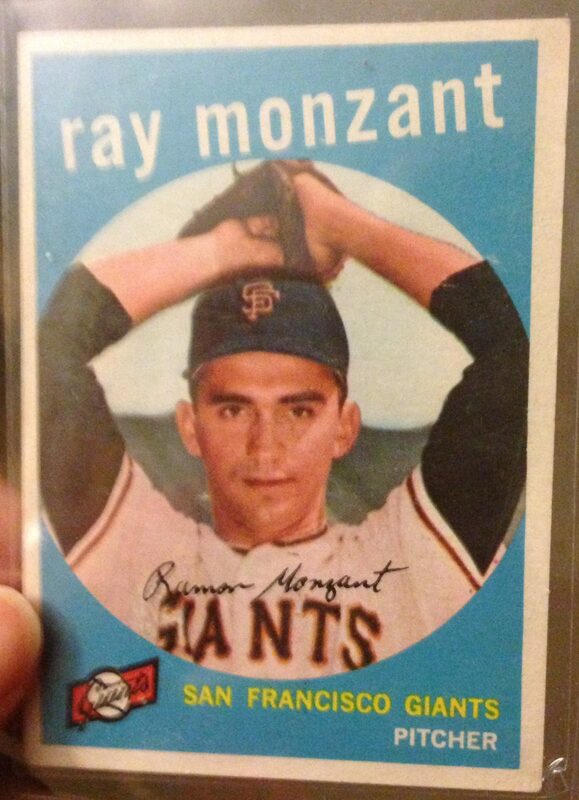 Where Topps in the 1960s defined and refined what baseball cards are supposed to look like, the 1950s cards are a little more all over the place. The best thing is that many of the 1950s designs seem to polarize opinions. * Some people will love a given year; others will hate it; there’s rarely any in-between. 1958 and 1959 are two designs which exemplify this. Some people love the colors. Others hate the small photos. *Yes there are some gems like 1956 which everyone likes. I love them as artifacts of their time but I also feel that they need to be left there. I’ve never really liked baseball cards which paint over the photo background with a design—whether it’s a solid color or all that refractor stuff going on today. 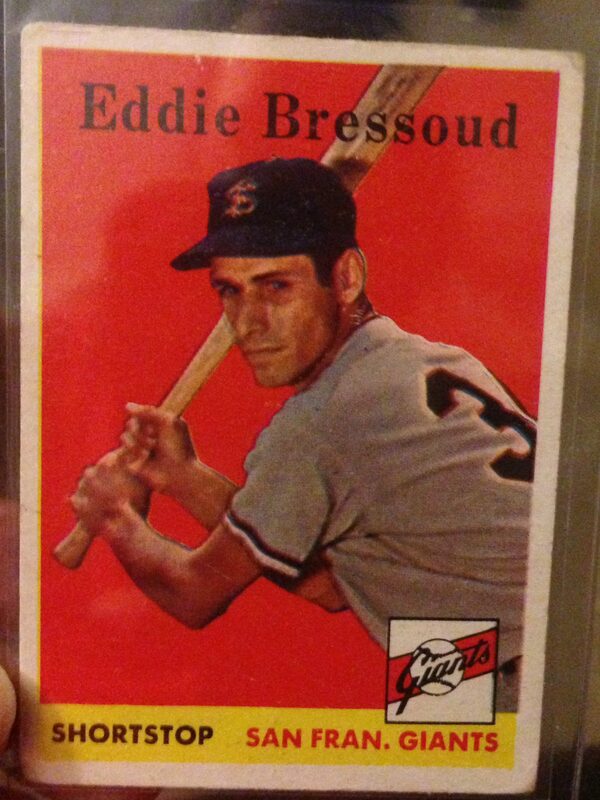 I like that this particular 1958 reminds me of the Cracker Jacks cards with their red backgrounds. And I appreciate the 1950s-ness of the lettering. The 1959s are pretty similar. As with the 58s, I can appreciate the colorfulness of them all. And I like the way the font is hinting at what’s to come in the 1960s. * But good lord those photos are small and feel like the secondary photos that Topps would later use. *Typewise the design evolution from 1958 to 1960 feels very natural. But wait there’s more. 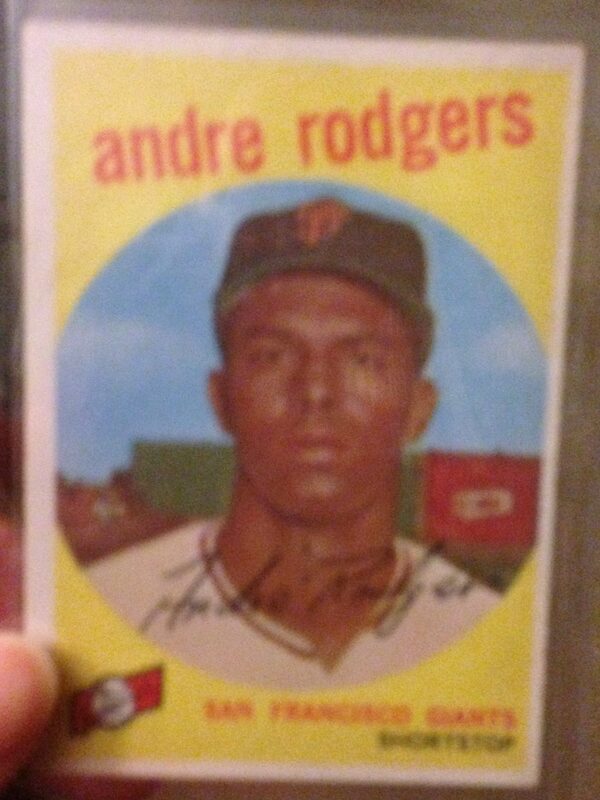 The 1960 rookie is a nice bridge between the 1959 design and the circus colors of the 1960 design. 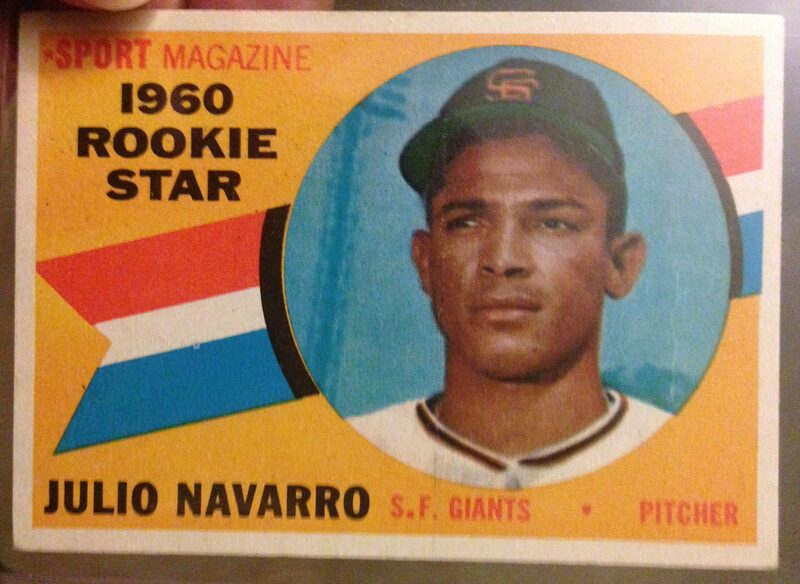 And the 1962 is one of those sets which, as someone who really got started in the hobby in 1987 when Topps had another wood-grain background design, just scratches all my nostalgia buttons. That the Giants went to the World Series this year is a bonus. And yeah. Super generous from Bob and I have no idea how to properly thank him. It’s very cool to be back to trading cards again. It’s going to be immensely fun to see these all in person. This entry was posted in baseball, Giants, trades and tagged commishbob. Bookmark the permalink.